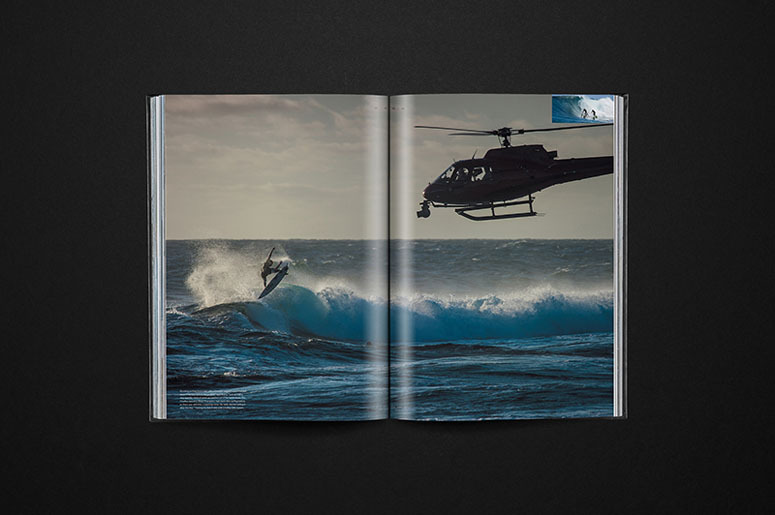 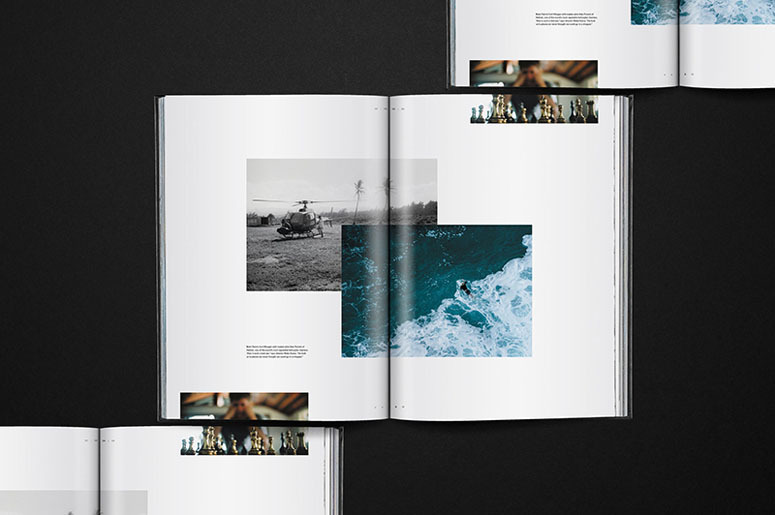 Before production of View From A Blue Moon (an action sports film starring professional surfer John Florence) began, we knew that a print piece would be just as critical to the project’s success as the film. 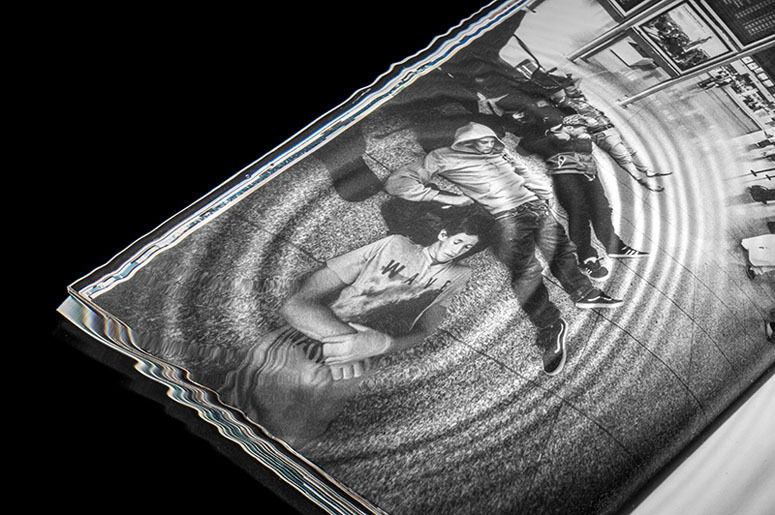 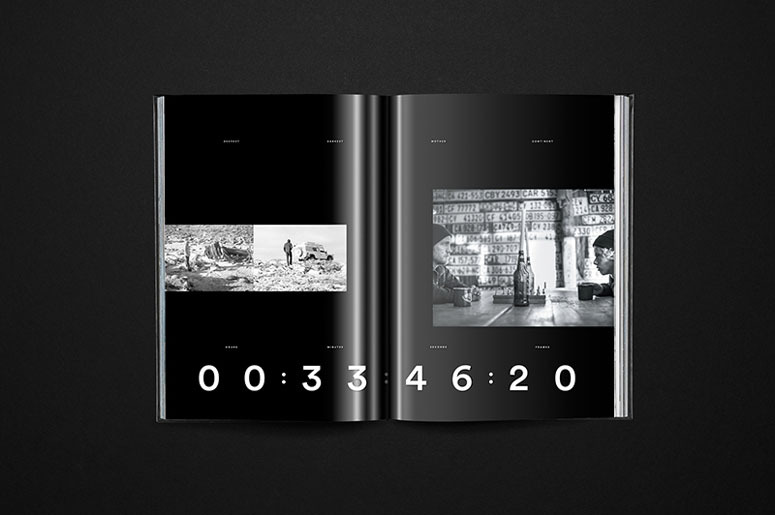 A plan was developed to have photographers on hand to meticulously document every moment of the production process. 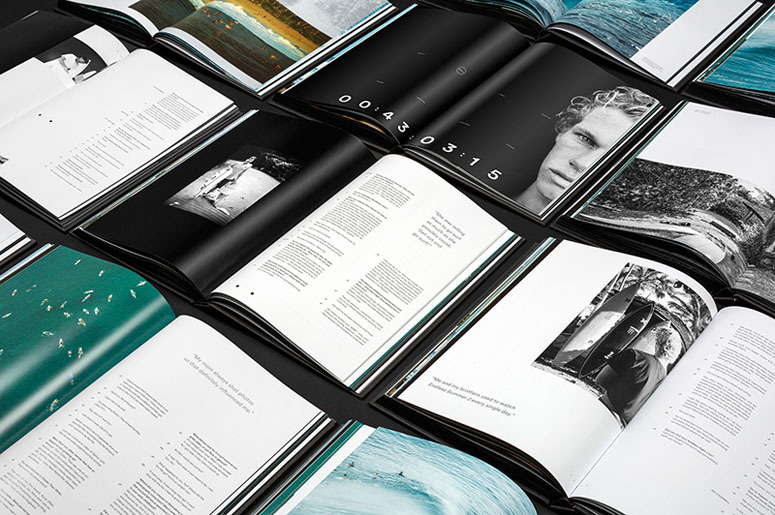 Between these photographers, John Florence’s personal images, and terabytes of 4K footage to pull framegrabs from, there’d be more than enough visual content to create the in-depth documentation of the three-year project. 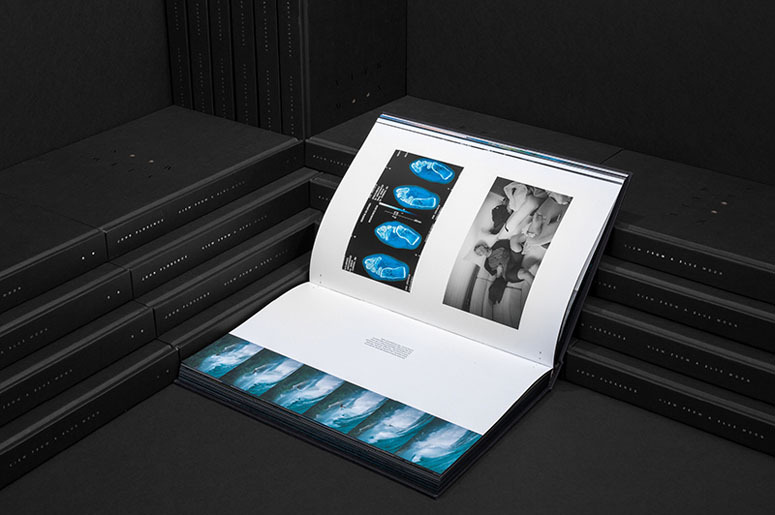 When production wrapped, nearly 50,000 images were cataloged. 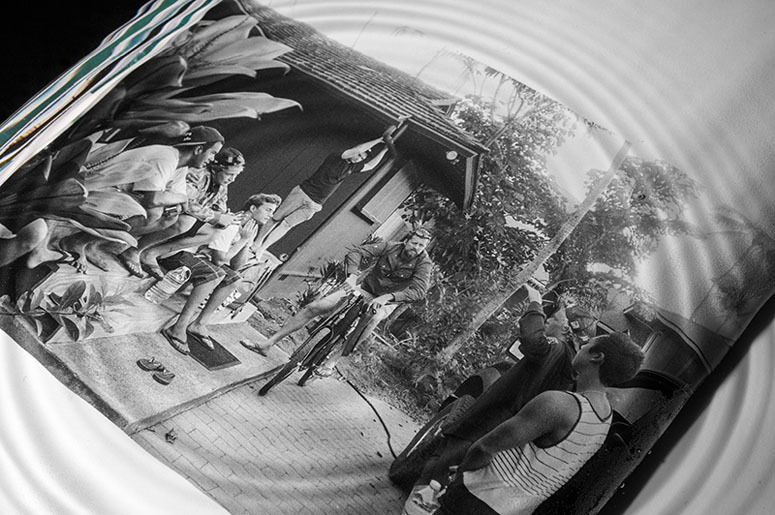 After three rounds of photo editing, we got the image selects down to a much more manageable amount: 2,000. 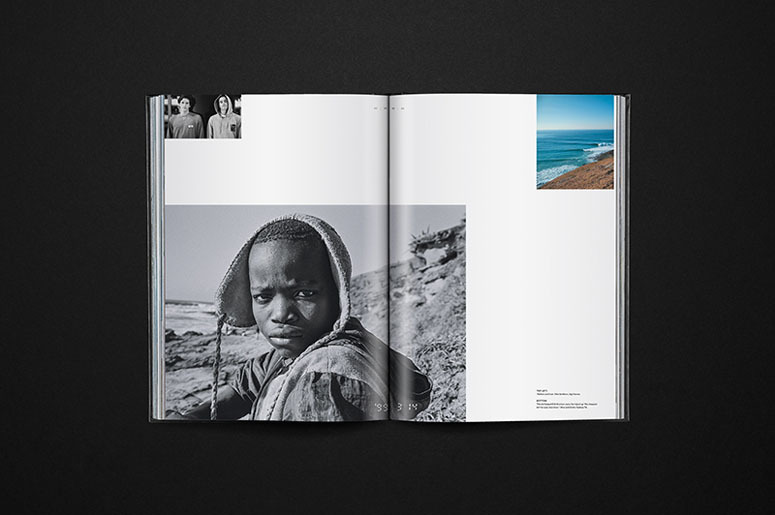 These selects ranged from decades-old family photos to RED framegrabs shot from helicopters flying over desolate stretches of African coastline. 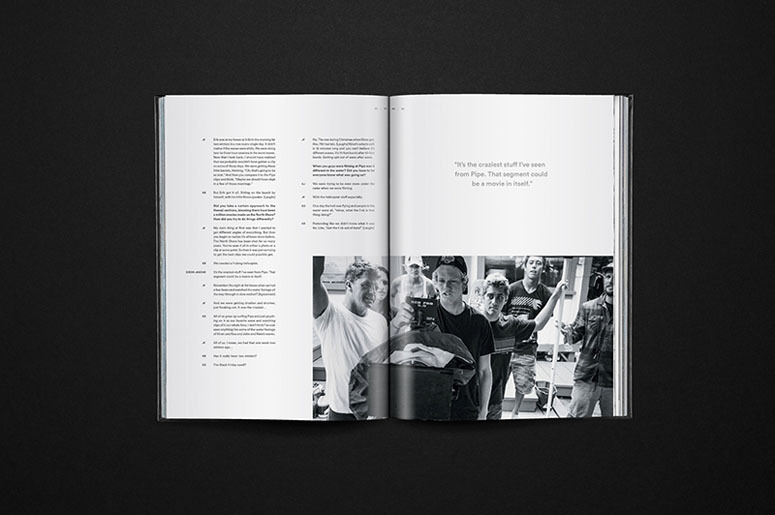 We then collaborated with CR Stecyk III and the Hurley team to craft the written content, which ranges from unguarded interviews with the cast and crew to long-form essays. 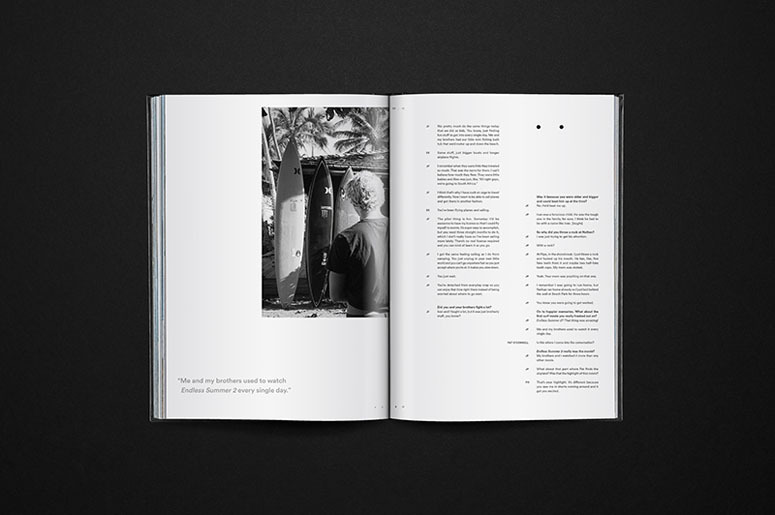 It was crucial that the book and film felt like extensions of one another. 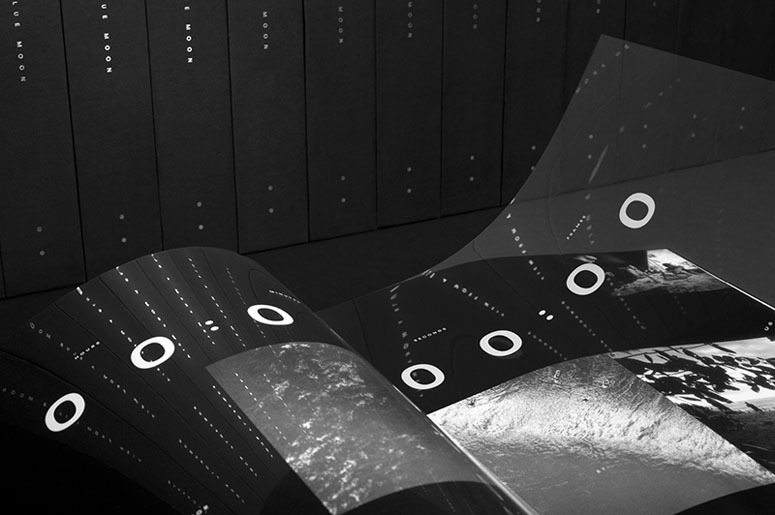 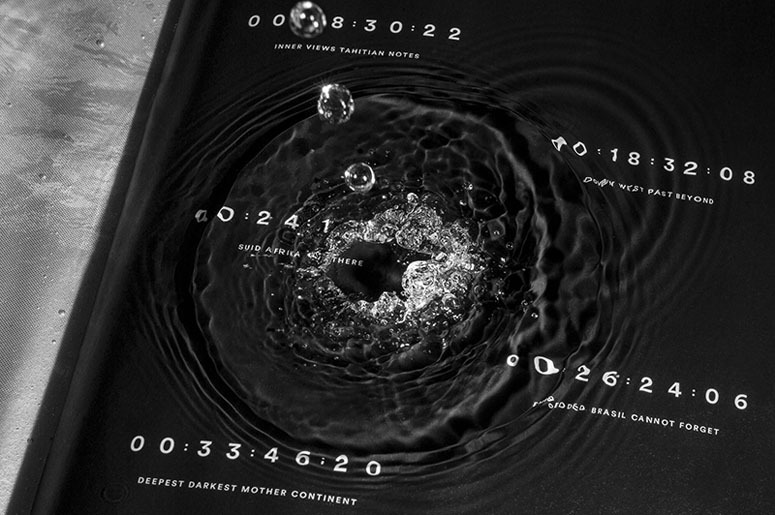 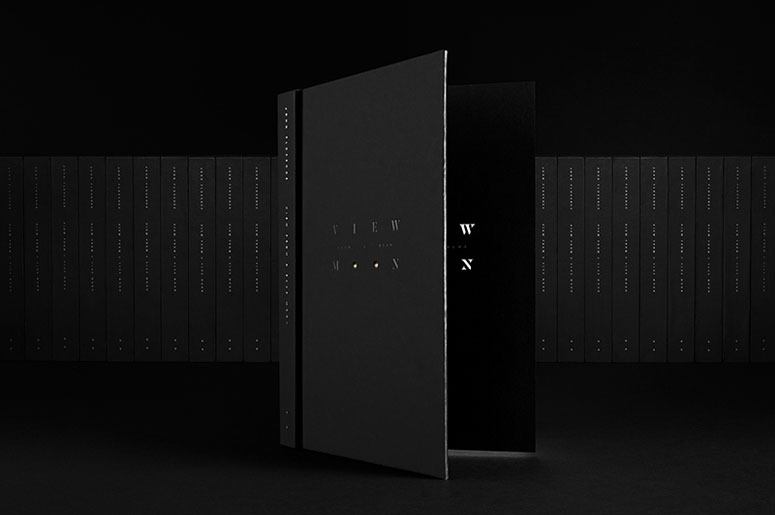 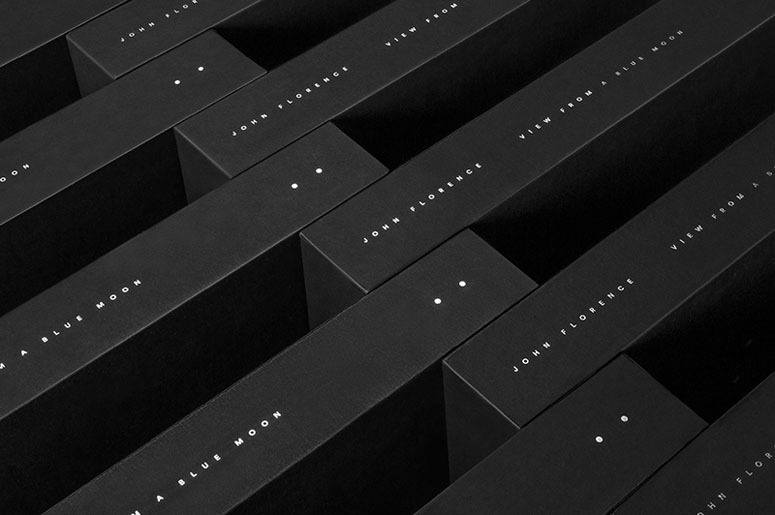 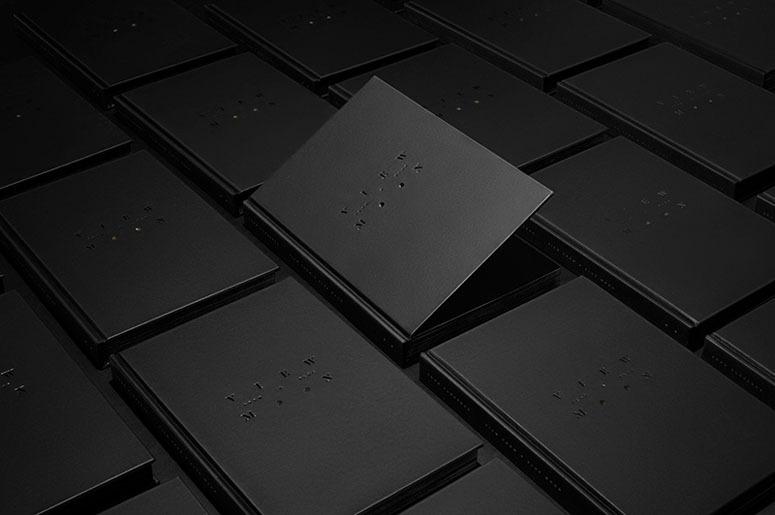 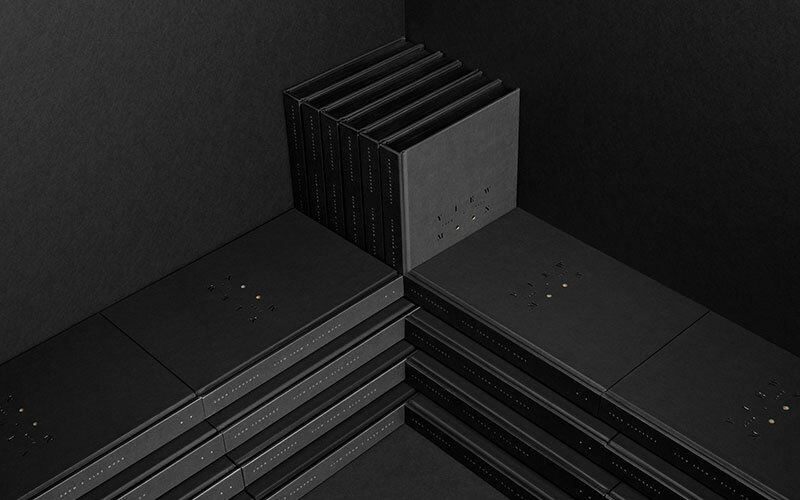 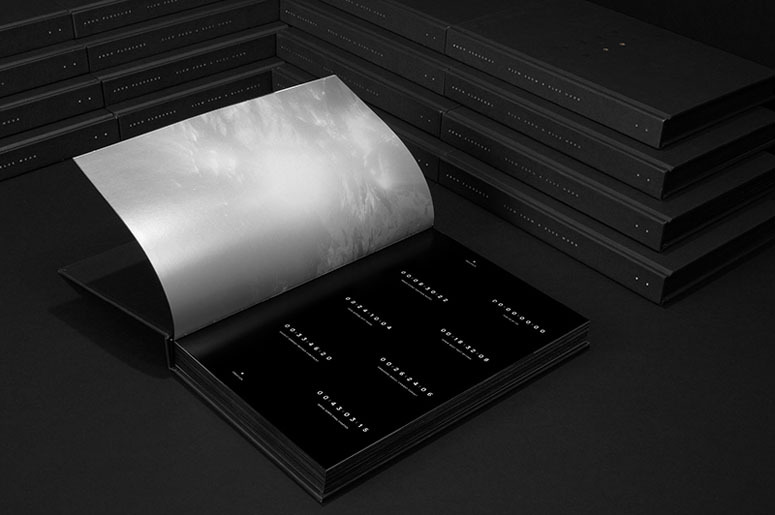 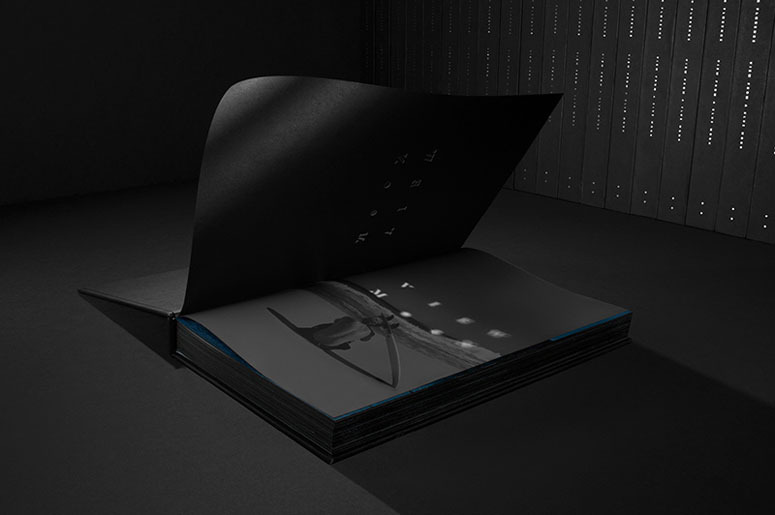 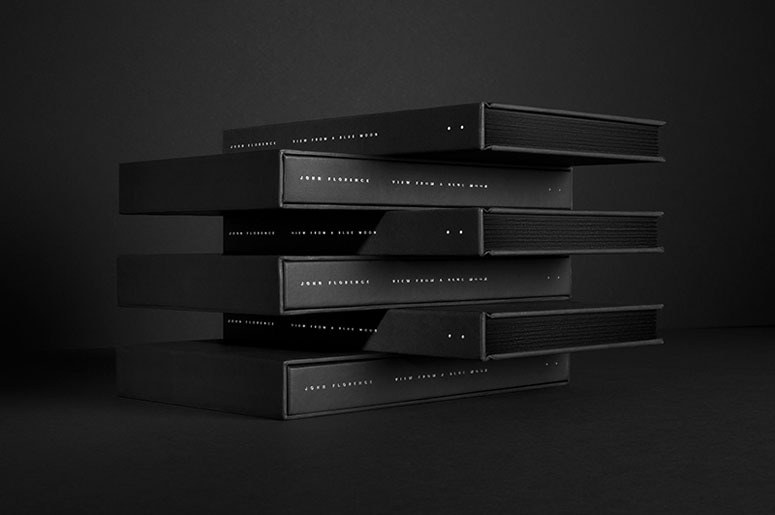 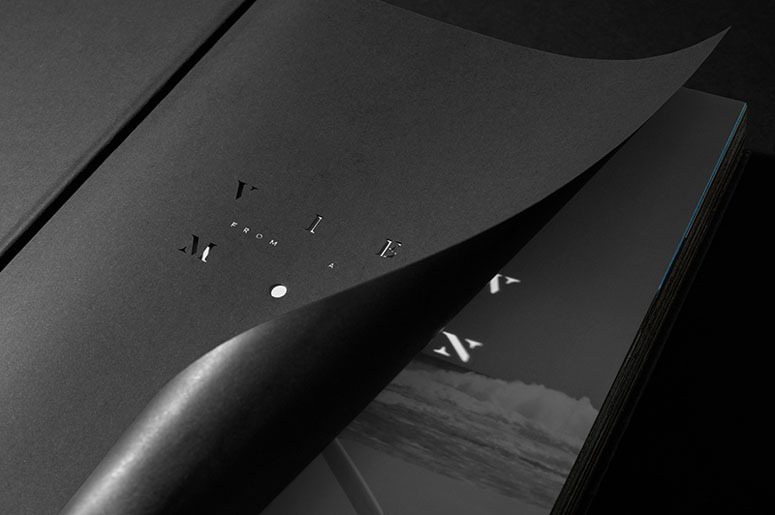 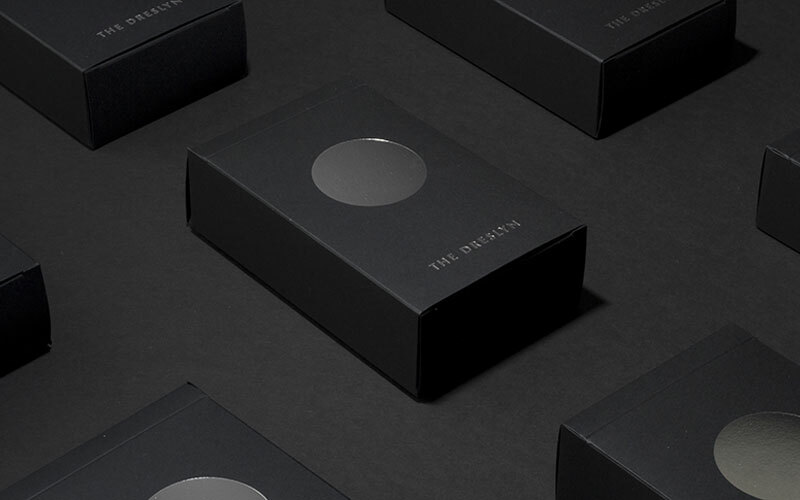 For the look and feel, we extended the black-on-black aesthetic common throughout the film’s branding and focused on specialized printing techniques to instill a perception of understated sophistication. 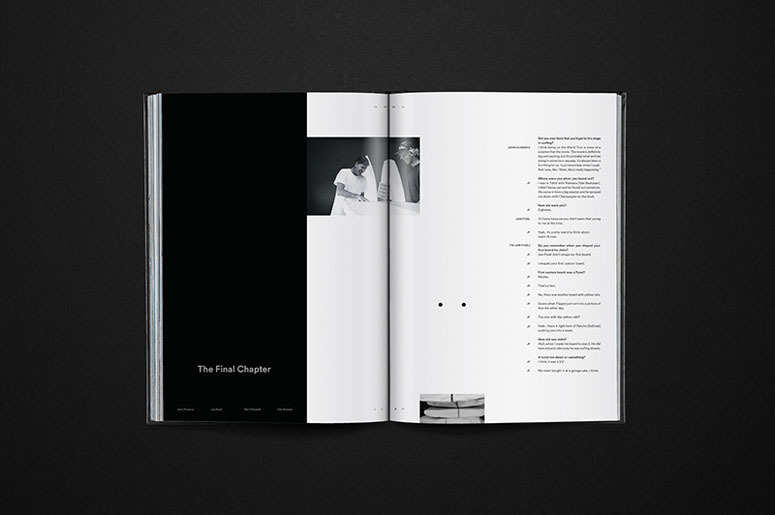 The book’s content structure mirrors the film, with each chapter identified by its starting timecode of hours, minutes, seconds, and frames. 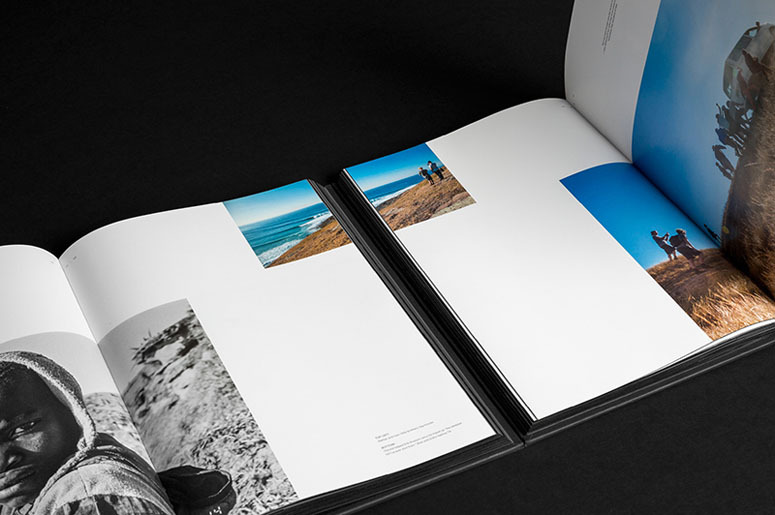 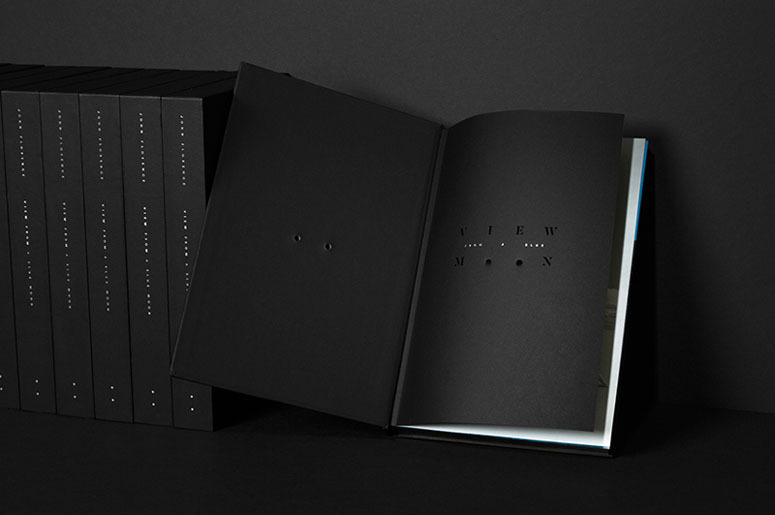 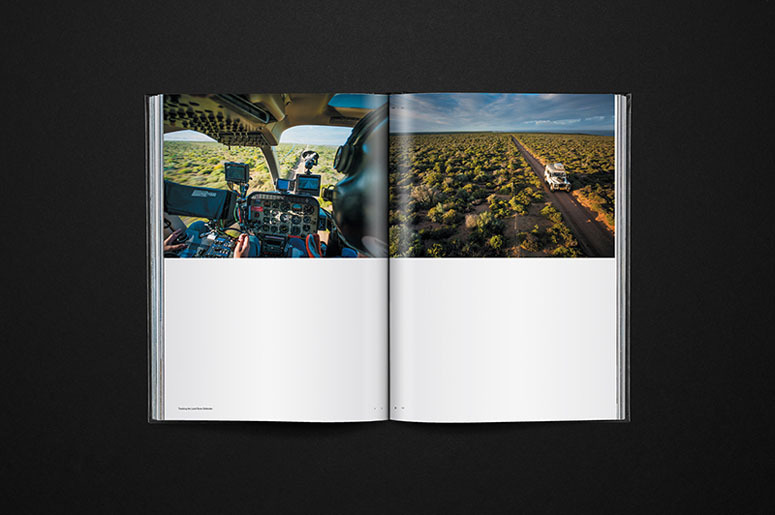 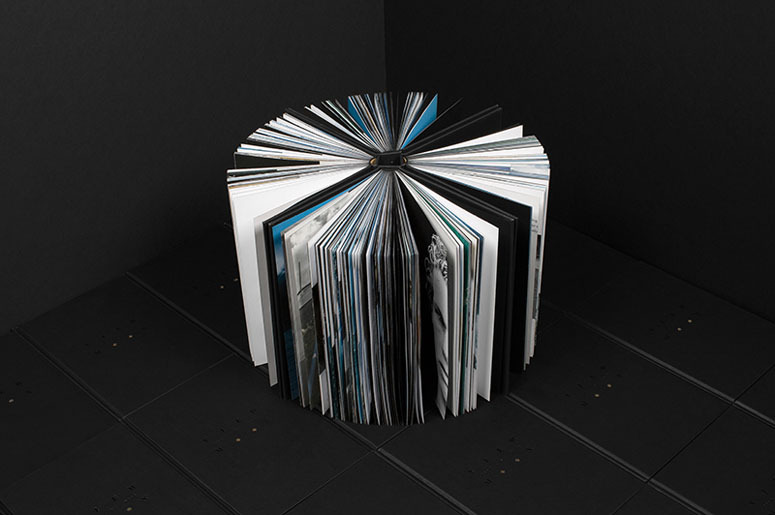 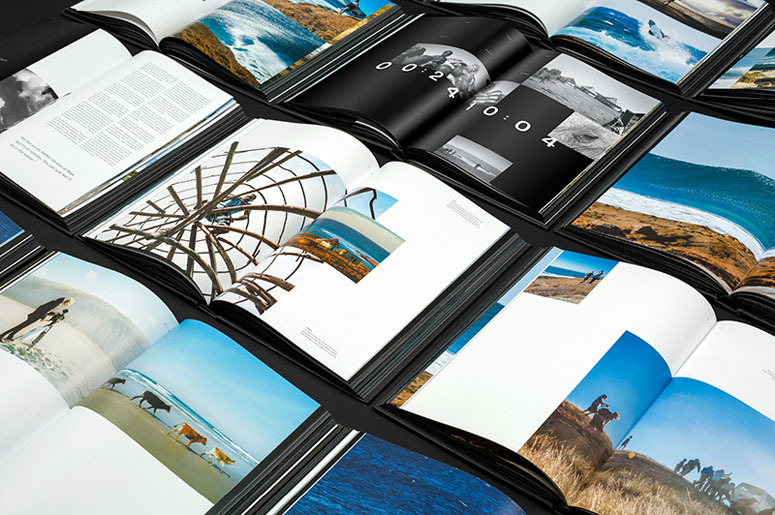 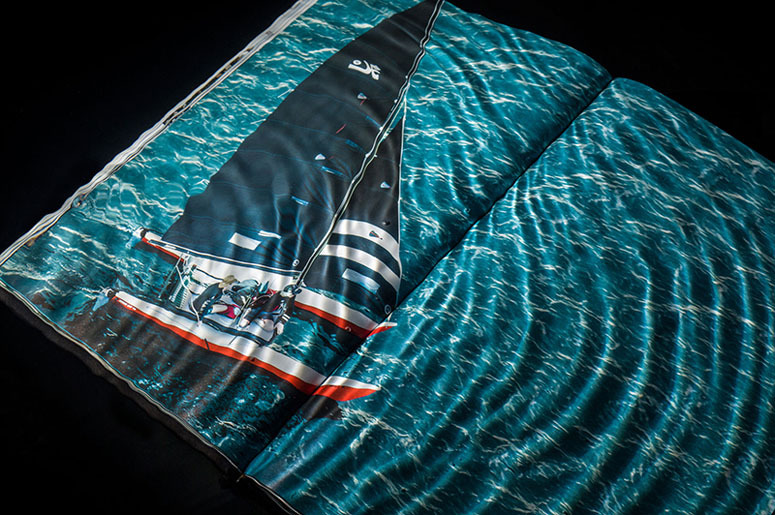 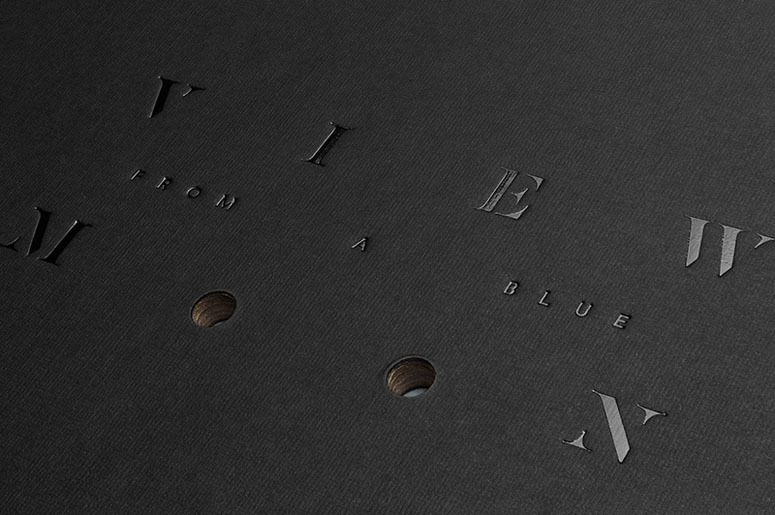 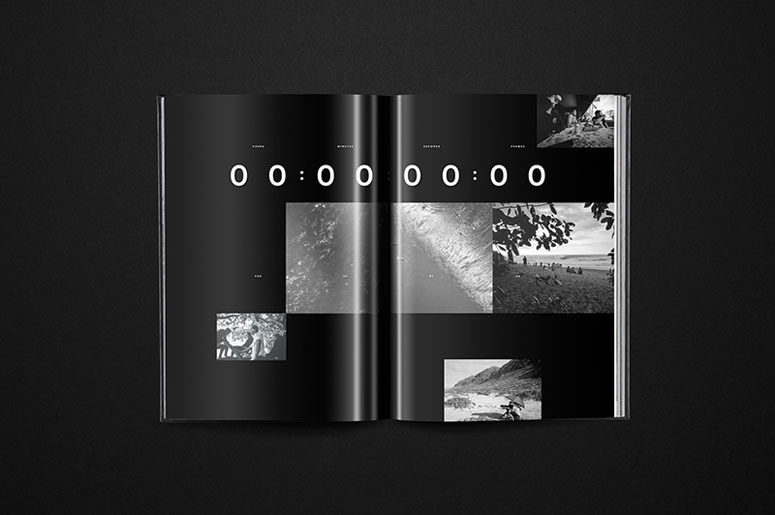 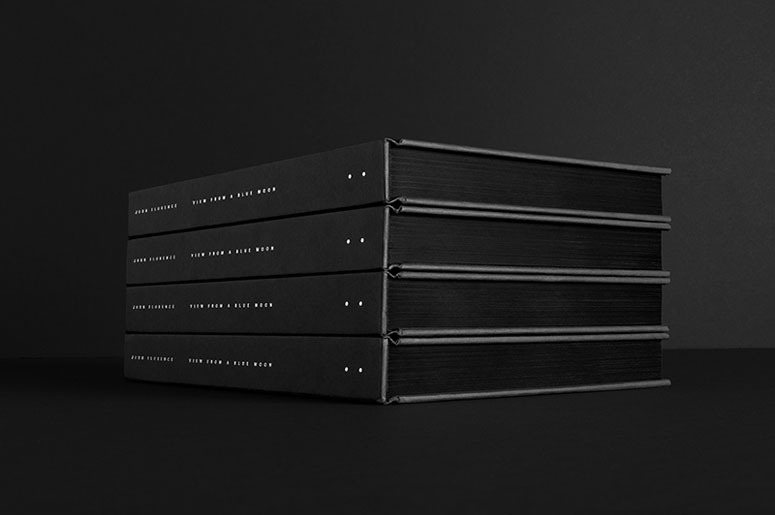 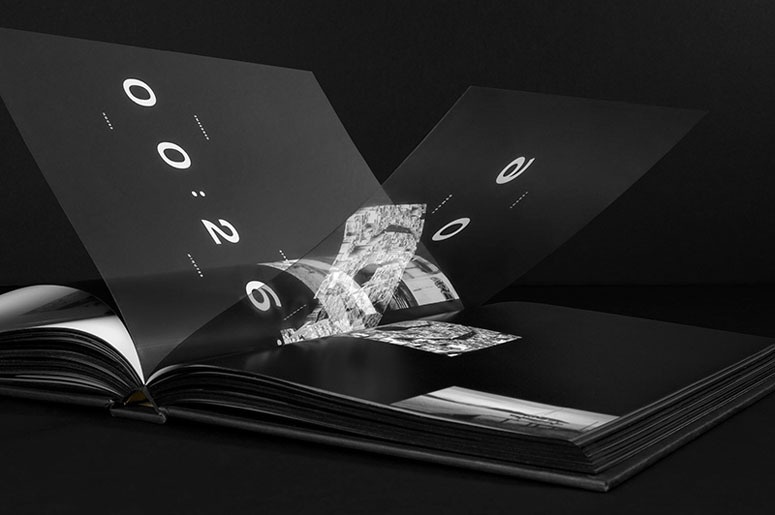 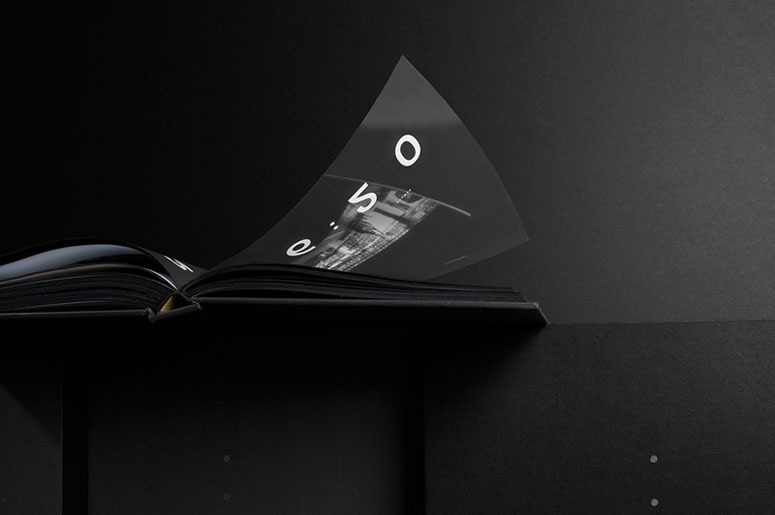 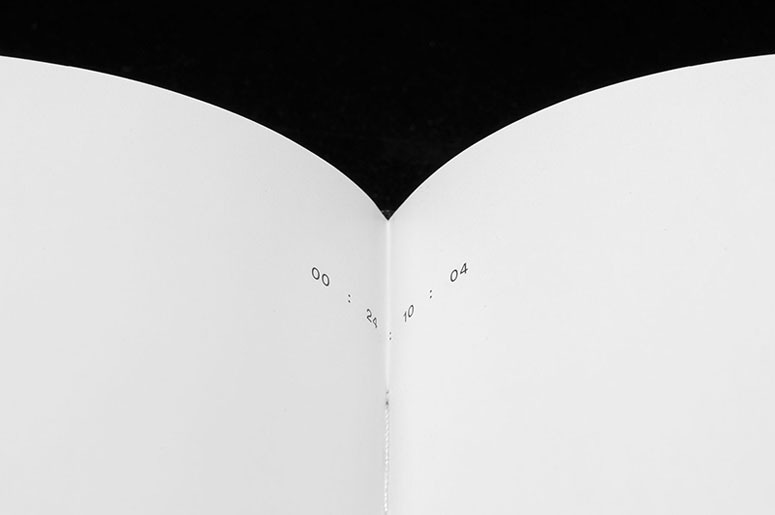 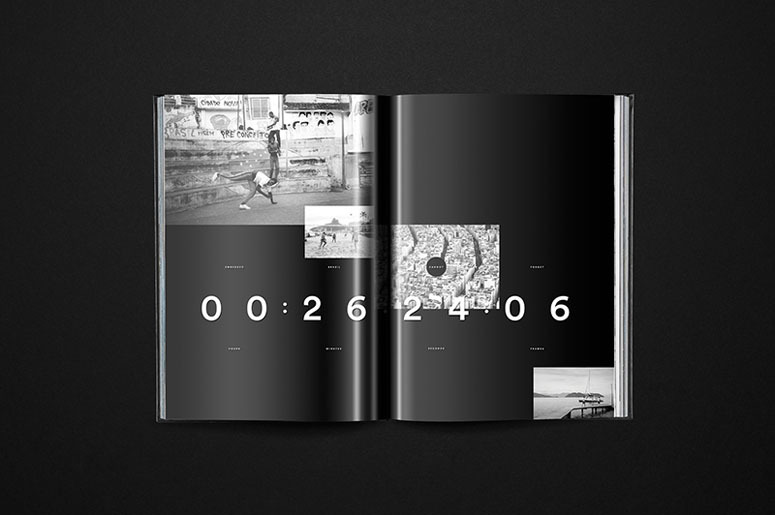 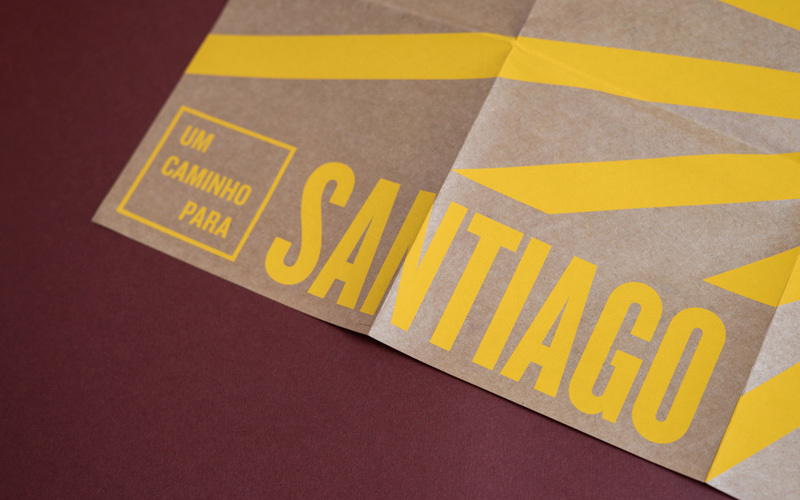 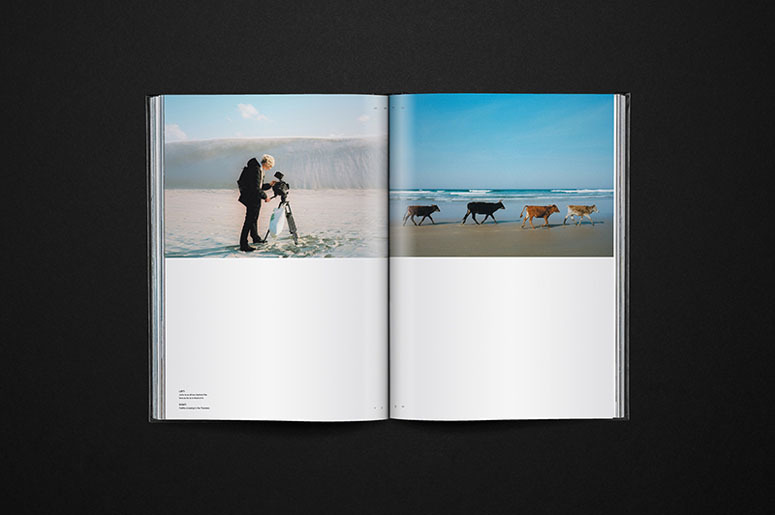 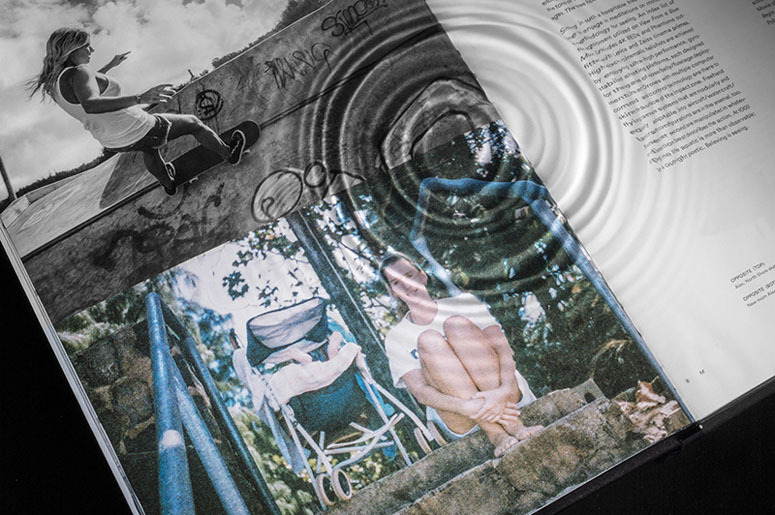 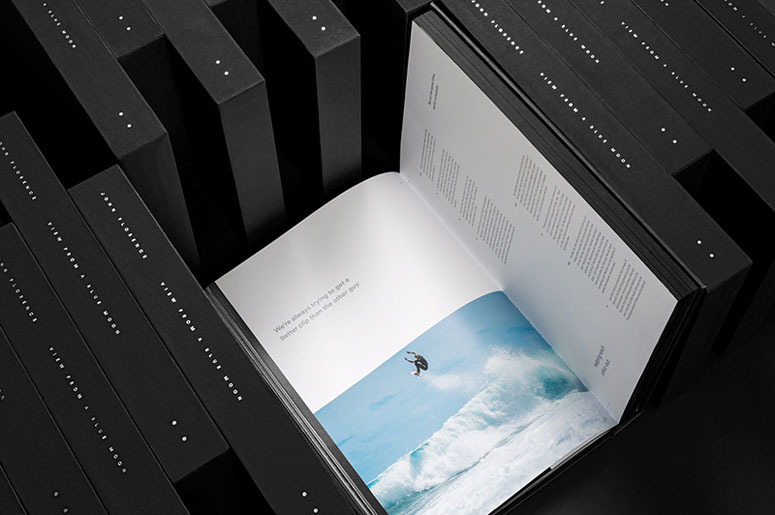 The entire book production process, from concept to final product in hand, was nine months. 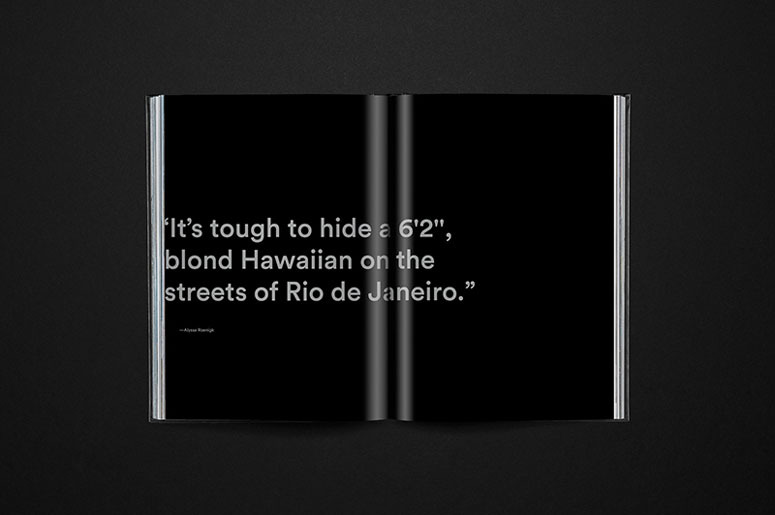 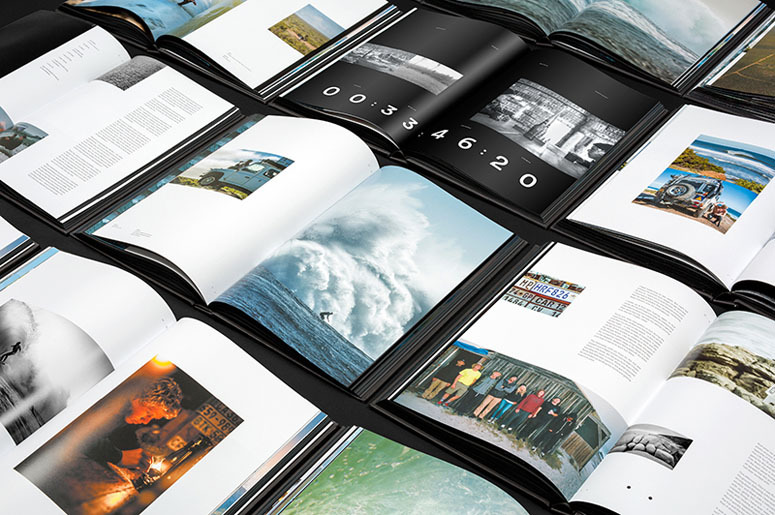 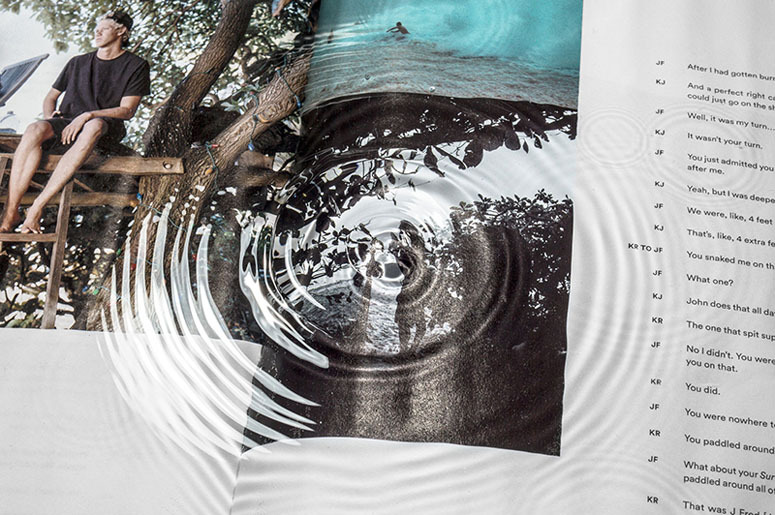 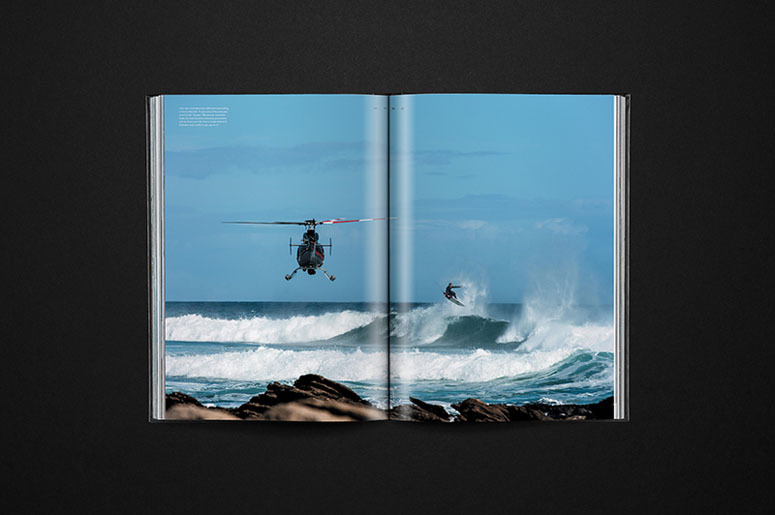 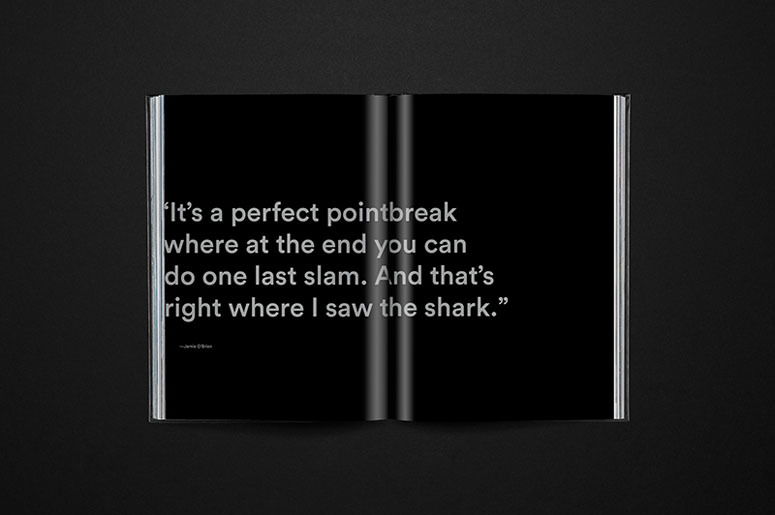 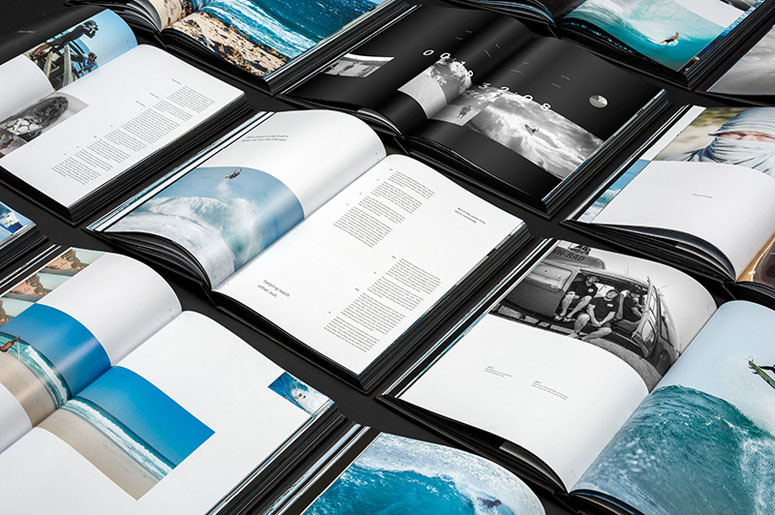 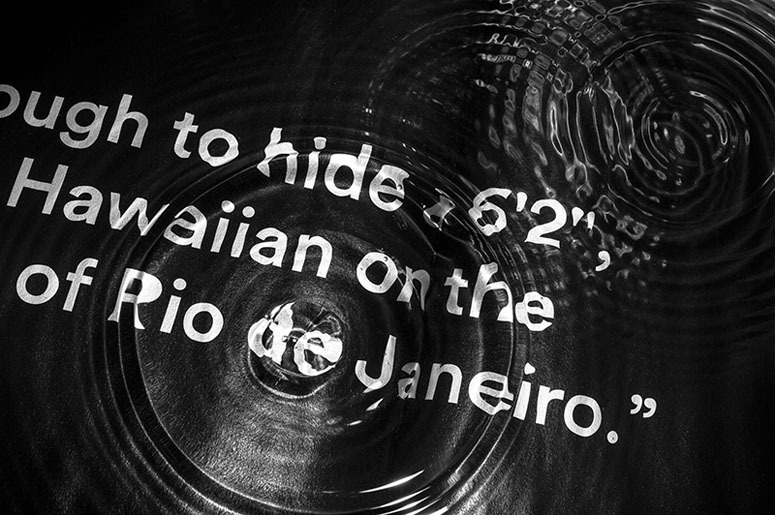 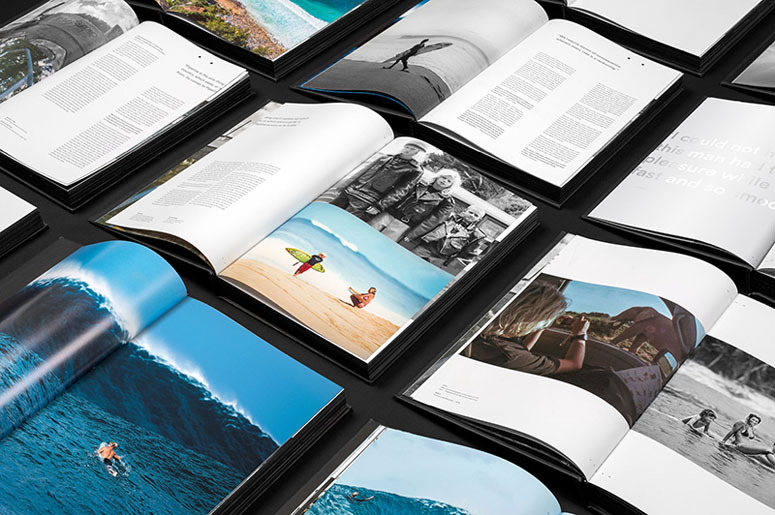 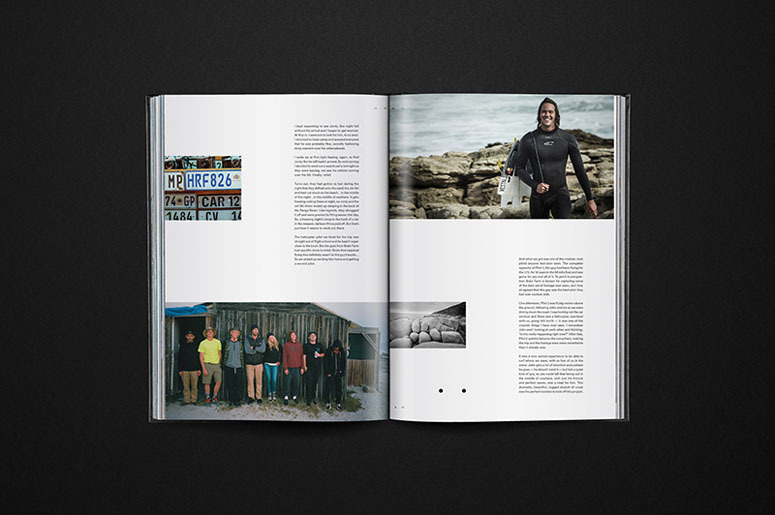 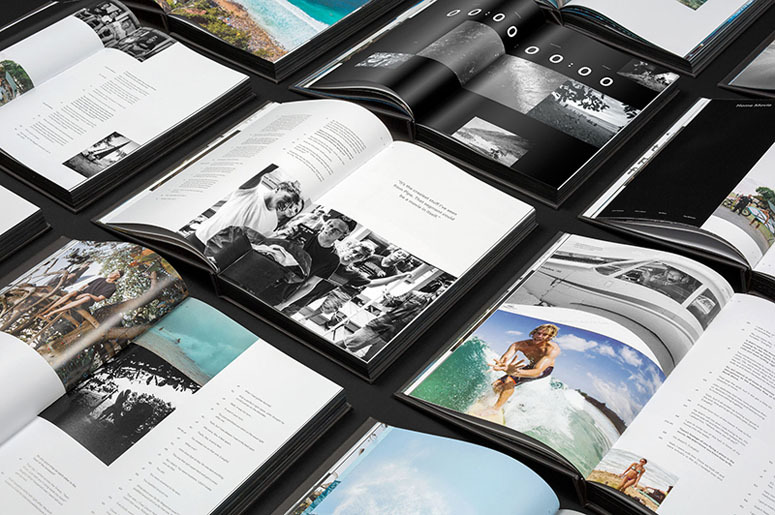 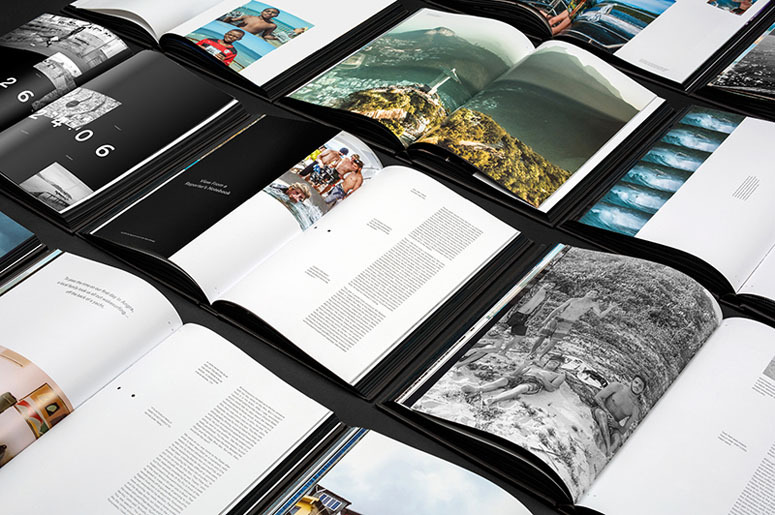 We had countless internal rounds of design and editing before presenting the nearly-final product to John Florence, Blake Vincent Kueny (the Director), and the Hurley team. 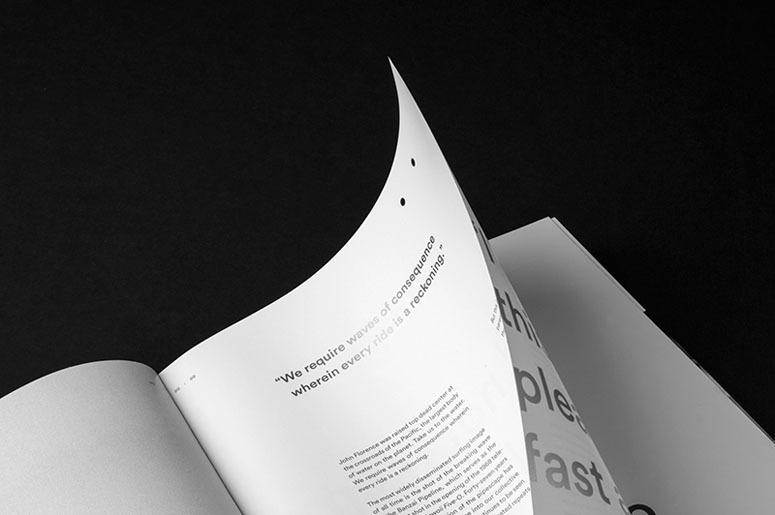 From there we made our finishing touches to all 315 pages before working closely with the factory to move into production. 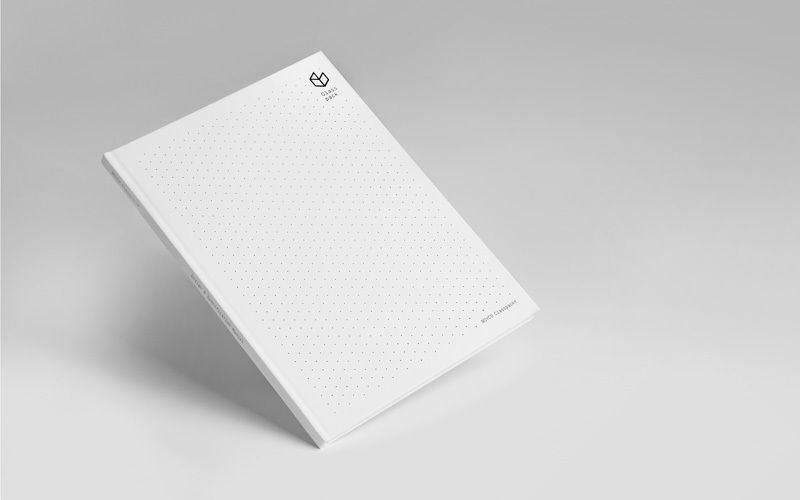 The final product is something that we hope exists on a bookshelf for years to come. 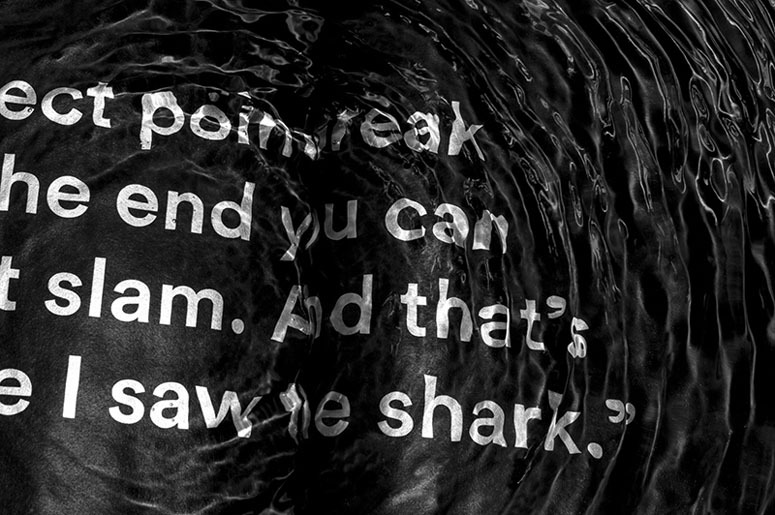 We know it will be on ours. 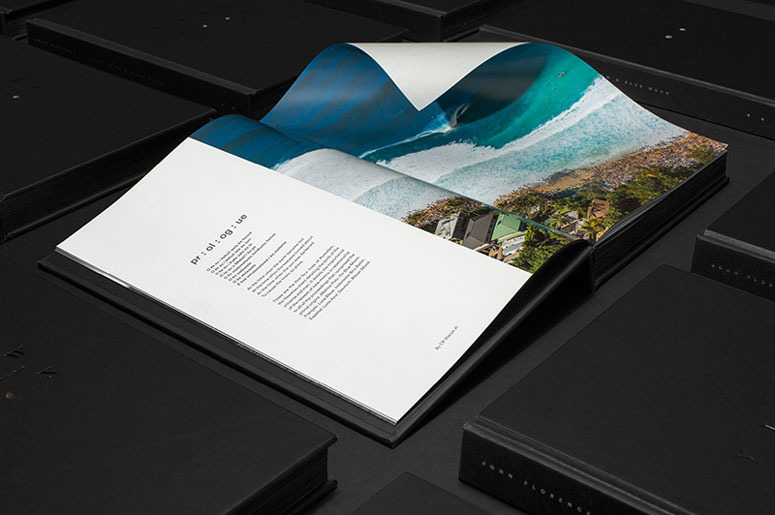 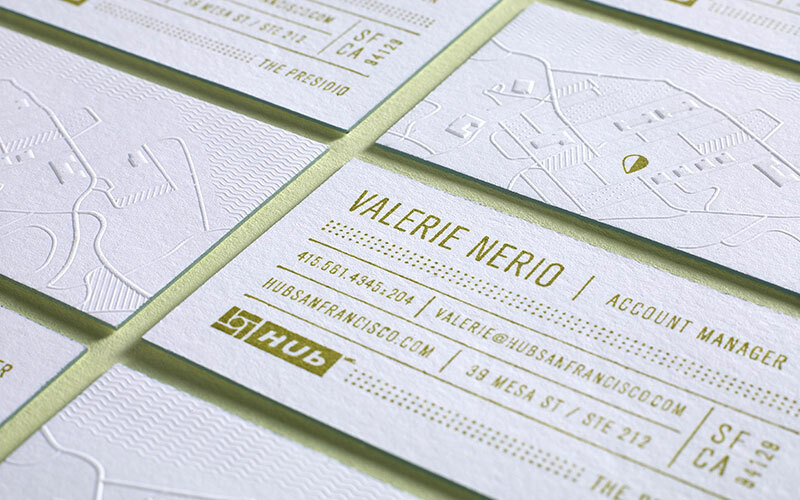 Everyone at Wedge & Lever has a background in editorial, so a majority of the challenges we faced on this project had been encountered on other projects in the past. 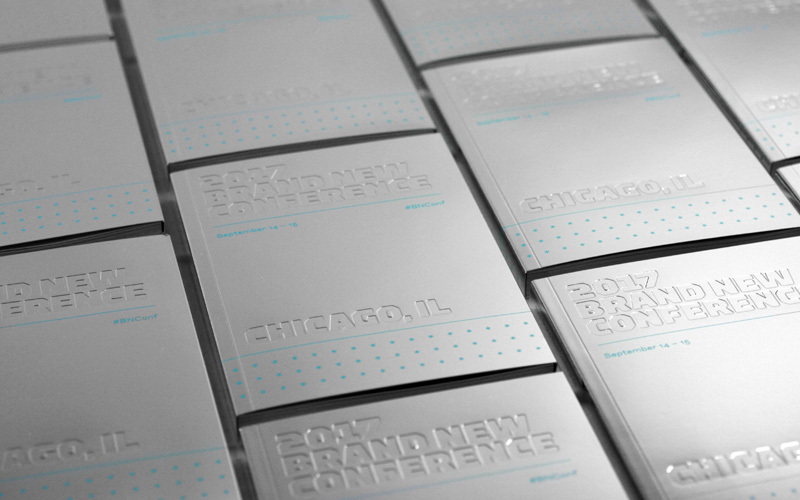 With that said, the primary challenge was balancing the schedule with the amount of specialty printing techniques that we wanted to, and for the most part did, incorporate into the book. 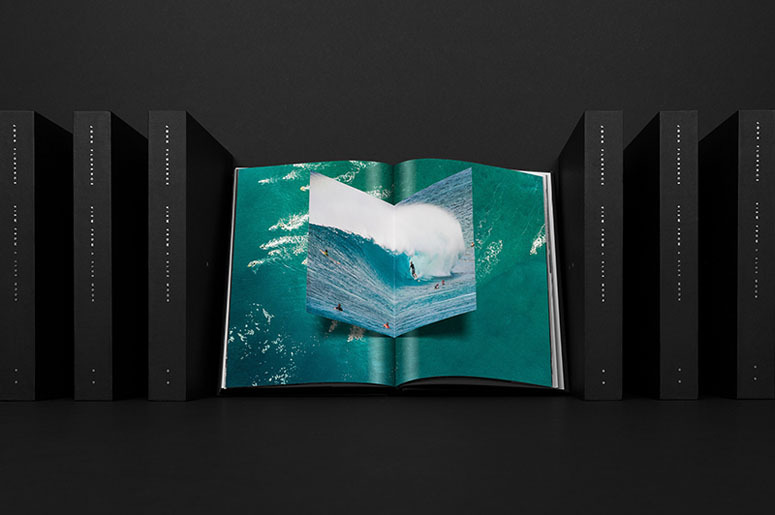 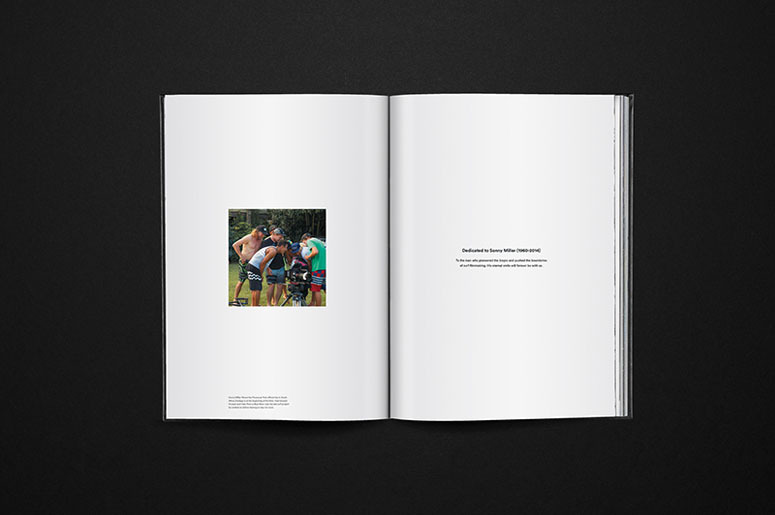 The team at Hurley gave us carte blanche, but they also needed the book to be released at the same time as the movie, which made the book production schedule a bit tighter than we would have liked. 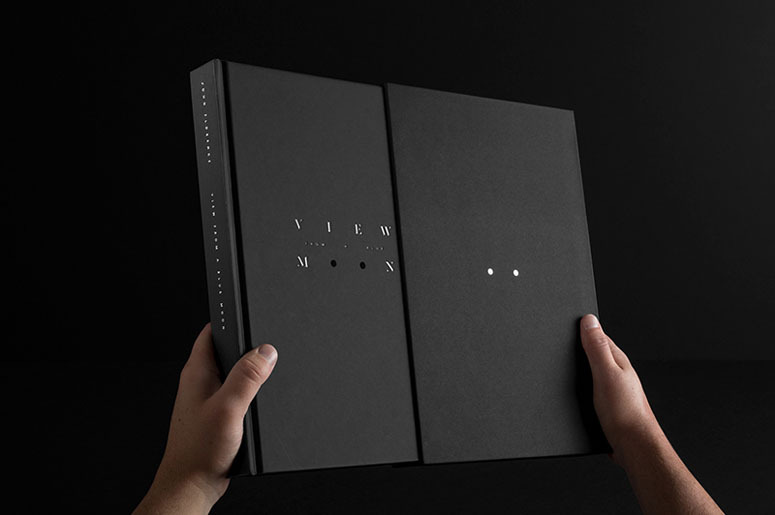 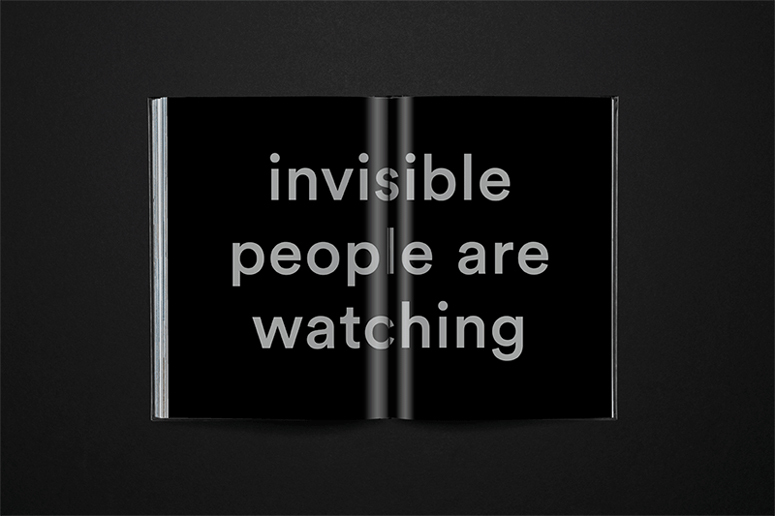 The book (and slipcase) feature quite a bit of hot foil stamping, die-cuts (through the cover and end sheet), black flocking on the edges, Pantone Silver C on a lot of the inner pages, and transparent PVC insert pages with silkscreening for each chapter opener. 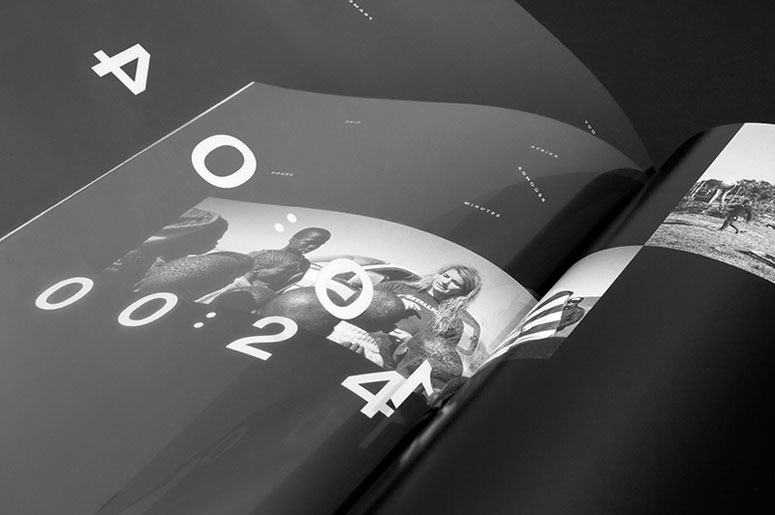 Getting the printer to nail all these elements required quite a bit of back and forth. 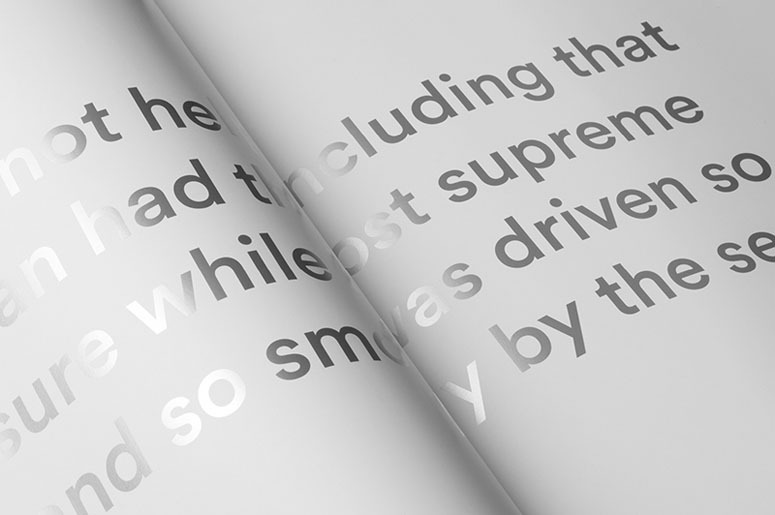 My apologies right from the start for the large amount of images included in this post. 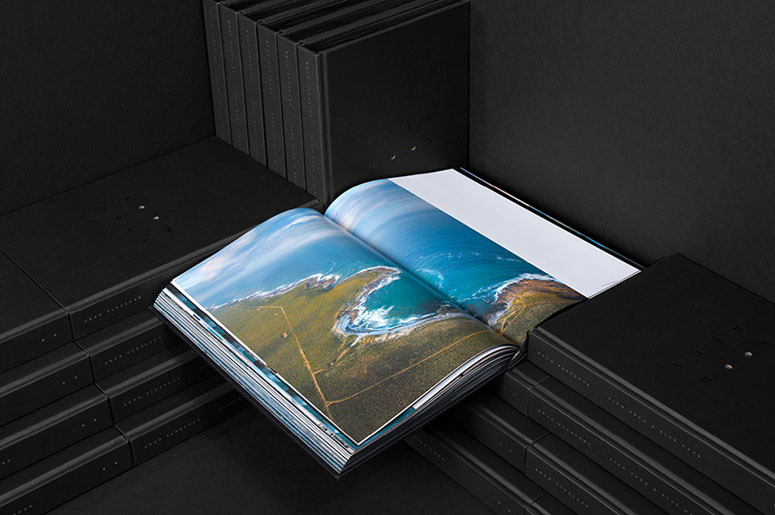 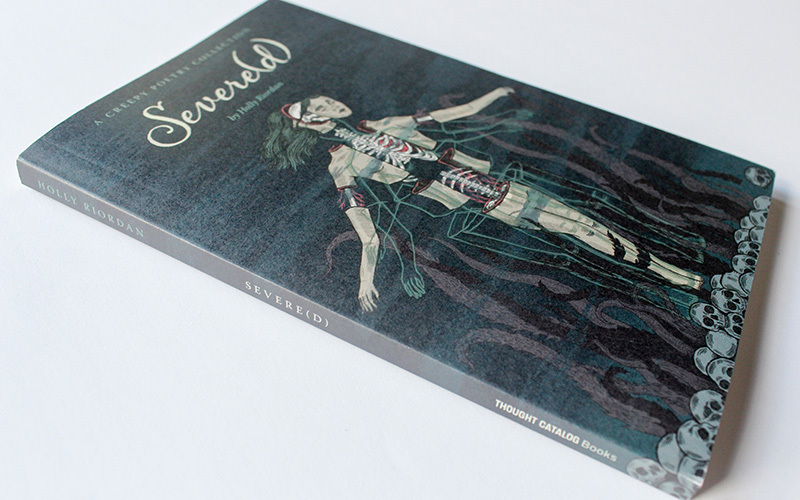 This book is so amazing that I figured I might as well give you the whole package instead of selectively deprive you of details and scrumptious spreads. 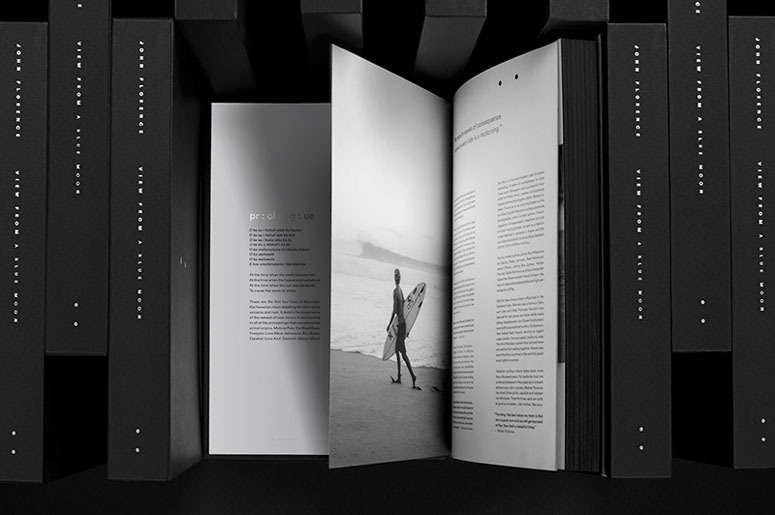 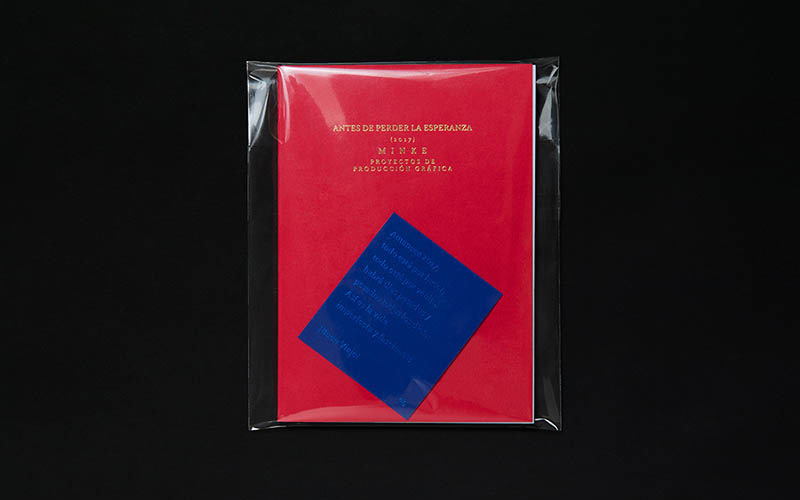 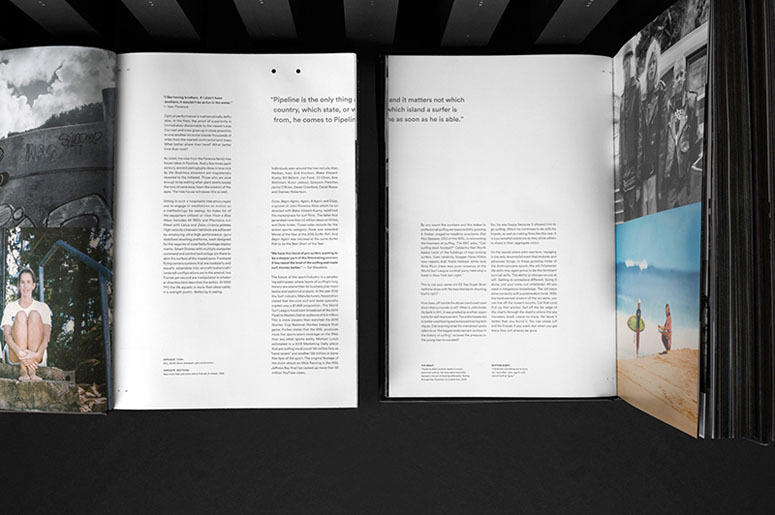 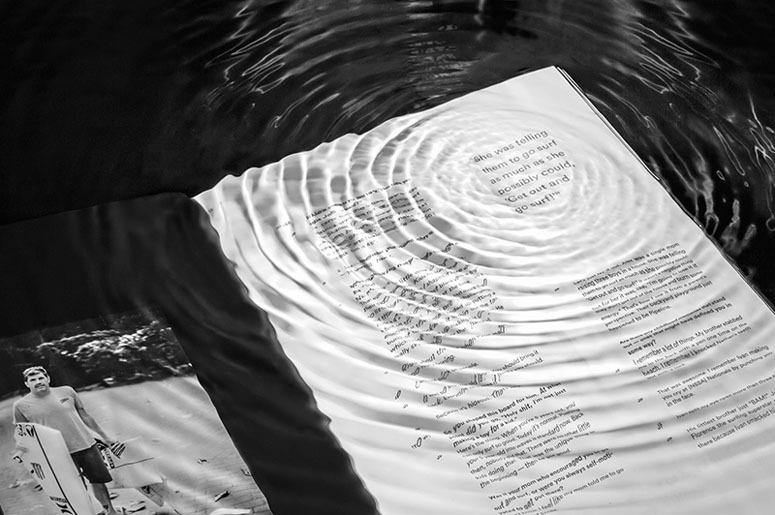 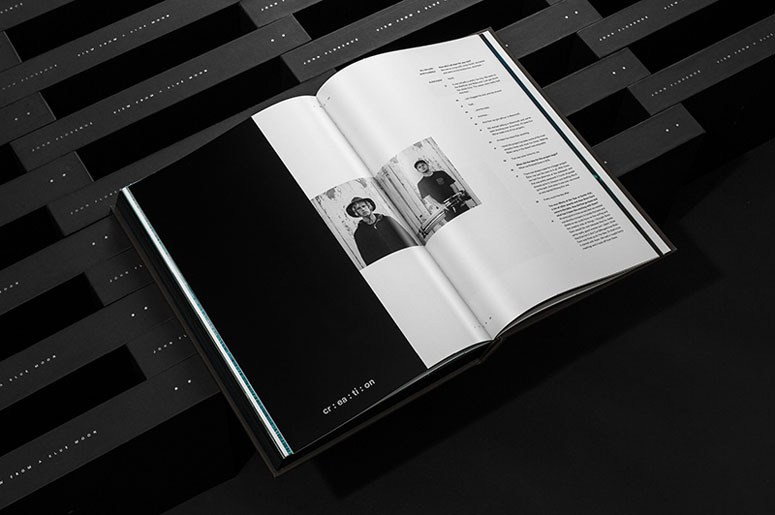 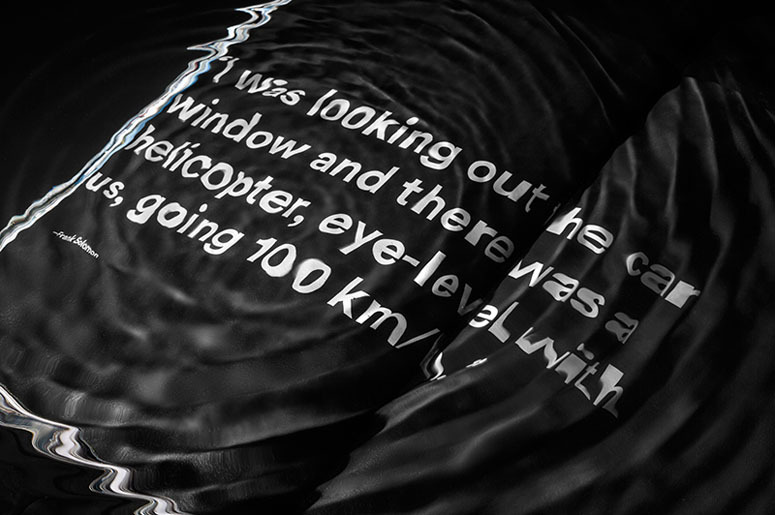 There is no doubt in my mind that there was great communication between the designers, the client, and the printer--there is no other way to produce a book this ambitious in such a short period of time.